A classic piece of English solid oak furniture from the Late Victorian period. 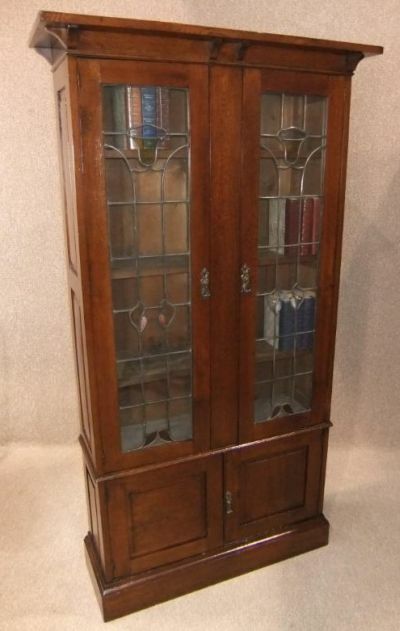 This lovely leaded and glazed arts and crafts oak bookcase features two large opening doors to top, revealing three fully adjustable internal shelves. This bookcase has a small cupboard below, stands upon a plinth base, and is in a beautiful warm chestnut colour. The item is in lovely condition for its age; circa 1890, and we believe that it has recently been re-polished. As you can appreciate, this arts and crafts oak bookcase is over one hundred years old, and so, will have minor blemishes and signs of wear and tear due to its age. Sadly, we do not have the keys for the locks.